The newest Illinois faculty members named to the National Academy of Sciences are from left, Eduardo Fradkin, physics, and Martin Gruebele and Sharon Hammes-Schiffer, chemistry. 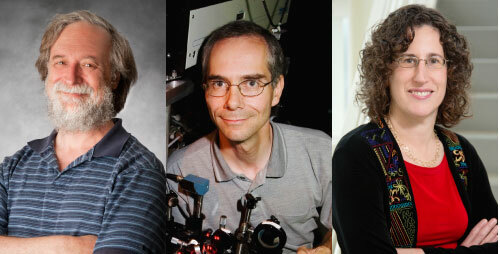 CHAMPAIGN, Ill. - Three faculty members at the University of Illinois at Urbana-Champaign have been elected 2013 fellows of the National Academy of Sciences. Eduardo Fradkin, Martin Gruebele and Sharon Hammes-Schiffer are among the 84 new members and 21 foreign associates announced by the academy on April 30. Election to the NAS is one of the highest professional honors a scientist can garner. Chosen by their peers, the 2,179 members and 437 foreign associates are an elite group distinguished by their outstanding contributions to the fields of science and technology. "Our entire campus community is excited to learn that three of our colleagues have been named fellows in the National Academy of Sciences," said Phyllis M. Wise, the chancellor of the Urbana-Champaign campus. "It is wonderful to see the work of Eduardo Fradkin, Martin Gruebele and Sharon Hammes-Schiffer recognized by their peers. This is among the highest honors for a scientist in our country. It is a proud day for Illinois to see three more of our distinguished faculty taking their places in this prestigious institution." Fradkin, a professor of physics, is highly distinguished in the fields of theoretical condensed matter physics and quantum field theory, thanks to his pioneering work bringing the two fields together. His unique perspective in applying concepts from one area to the other have led to trailblazing developments in gauge theories, Dirac fermions, superconductors, topological phases, quantum entanglement and electronic liquid crystal states. Fradkin earned his doctorate in physics from Stanford University in 1979. He then came to the U. of I. as a postdoctoral research associate before joining the faculty in 1981. He is a fellow of the American Physical Society and of the American Academy of Arts and Sciences, and a member of the Asociación Física Argentina (Argentine Physical Association). Gruebele, the James R. Eiszner Endowed Chair in Chemistry and a professor of physics and of biophysics and computational biology, has distinguished himself in chemical and biological physics. Using laser manipulation techniques and computational modeling, his work has increased the understanding of protein folding in the test tube and in living cells, how energy flows through molecules and how glass surfaces morph and move. Gruebele earned his doctorate at the University of California at Berkeley in 1988. Since joining the U. of I. in 1992, he has earned a number of awards for both teaching and research, including a Packard Fellowship, a Cottrell Scholar Award and an Alfred P. Sloan Fellowship. He is a fellow of the American Academy of Arts and Sciences and a member of the Deutsche Akademie der Naturforscher Leopoldina (German Academy of Sciences). Hammes-Schiffer, a Swanlund Professor of Chemistry, is a world leader in theoretical and computational chemistry. Her research focuses on chemical reactions in solution, in proteins and at electrochemical interfaces, particularly the transfer of charged particles driving many chemical and biological processes. Her group has developed theories that blend classical molecular dynamics and quantum mechanics, as well as theories that describe proton-coupled electron transfer reactions. This work has applications in catalyst design for solar cells, understanding how enzymes work, protein engineering and drug design. Hammes-Schiffer earned her doctorate from Stanford University in 1993. She joined the faculty at Illinois in 2012. Among many other honors, she has received an NSF CAREER award, an Alfred P. Sloan research fellowship and the International Academy of Quantum Molecular Science Medal and is a fellow of the American Physical Society, the American Chemical Society and the American Academy of Arts and Sciences. The National Academy of Sciences is a private organization of scientists and engineers dedicated to the furtherance of science and its use for the general welfare. Founded in 1863, the academy acts as an official adviser to the federal government, upon request, in any matter of science or technology.